The Foundation Celebrates 50th Anniversary with 20th Annual Benefit Auction. 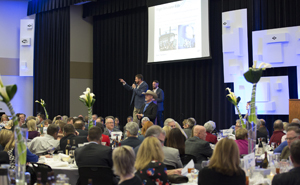 After months of planning, the Butler Community College Foundation held their annual gala – a three-course dinner, appetizers, live music and a silent and live auction. More than 380 guests bid on items, listened to music and ate delicacies as they supported the college with donations totaling more than $214,000. The funds raised at this event support the Foundation’s efforts to expand funding sources for the college, grow the endowment, and provide scholarship opportunities for students. Butler’s 20th Anniversary Benefit Auction celebrated the Foundation’s 50th Anniversary and was made possible by support from HollyFrontier, Professional Engineering Consultants, BG Products, MKEC and Bank of America Merrill Lynch. The high bids went to a media advertising bundle, a trip to St. Maarten, a flight simulator ride and a University of Notre Dame Football Experience. Hundreds of local businesses from both Butler and Sedgwick County helped with donations. Attendees bid on gift baskets, tickets, gift cards and jewelry from local merchants. The rooms at the Hubbard Welcome Center on the El Dorado campus were decorated with dozens of futuristic white chandeliers and sculptures. Design work was provided by Butler alumnus, Tom Mittlestadt of Mittlestadt Props & Design. Butler students were present in both set-up and performance. The theatre students helped decorate, while the culinary arts students helped in the preparation and serving of the dinner. The vocal music and jazz combo were members of the Butler Fine Arts department. Haleigh Wisdom of Goddard and Calder Clink of Arkansas City spoke to guests about their experiences at Butler and how attending the college helped them succeed. They cited the affordability, close-knit relationships and attention from faculty they received while at the school. Eight couples who have served as honorary chairs before returned in that special role this year. They are: Ray and Carolyn Connell, Matt and Pam Cross, Ted and Barb Dankert, Vince and Melody Haines, Wink and Libba Hartman, Greg and Helen Joyce, Shawn and Shawna Lancelot, and Lonnie and LaDonna Snook. Last year’s auction was recently listed as #14 on the Wichita Business Journal’s Top 25 Fundraising Events in the Wichita/Metro Area.